It seemed the mood was set when the band stepped to the stage greeted by a very enthusiastic roar and Trey cued the band for "PYITE." 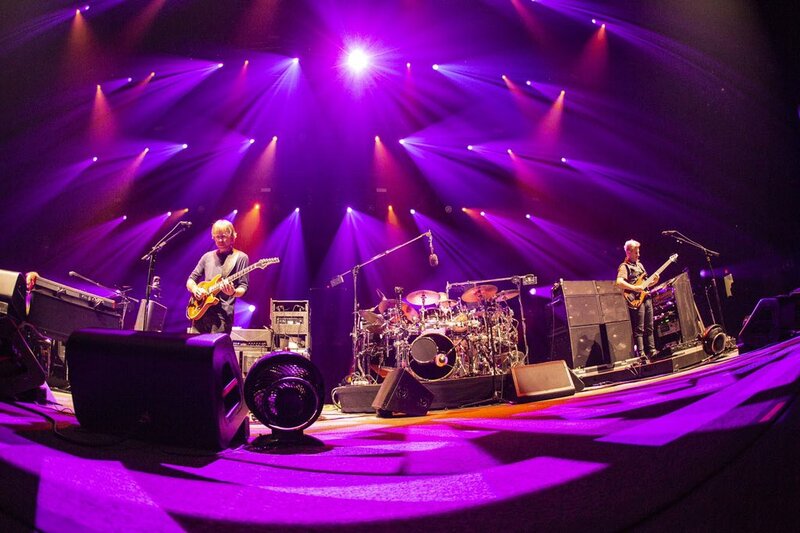 After a few tweaks by a stage tech, Phish launched into what could quite possibly be the best 3.0 version of the song. I don’t have the time at this juncture to listen to the intro jam of every one since 2009, but last night’s had the kind of extra syncopated staccato groove that you’d be much more likely to find in a version from 1997 than you would in one played any time during this decade. The band followed this exceptional opening by playing a handful of popular songs, including the very popular song "Reba," which they tackled with confidence. The real star of this set though is the newer classic "Mercury," which was given a rousing performance. The somewhat mystical lyrics seem to resonate with the audience and more and more the song tends to lead to a jam. Last night’s version went about as far as they’ve taken this recent vehicle and you can forgive a ripcord after 18 minutes, especially when Trey is calling up "Moonage Daydream." The first set closed with "Walls of the Cave," hoo-boy what a good time. Set break gave me some time to reflect on my first experience seeing Phish in Chicago. 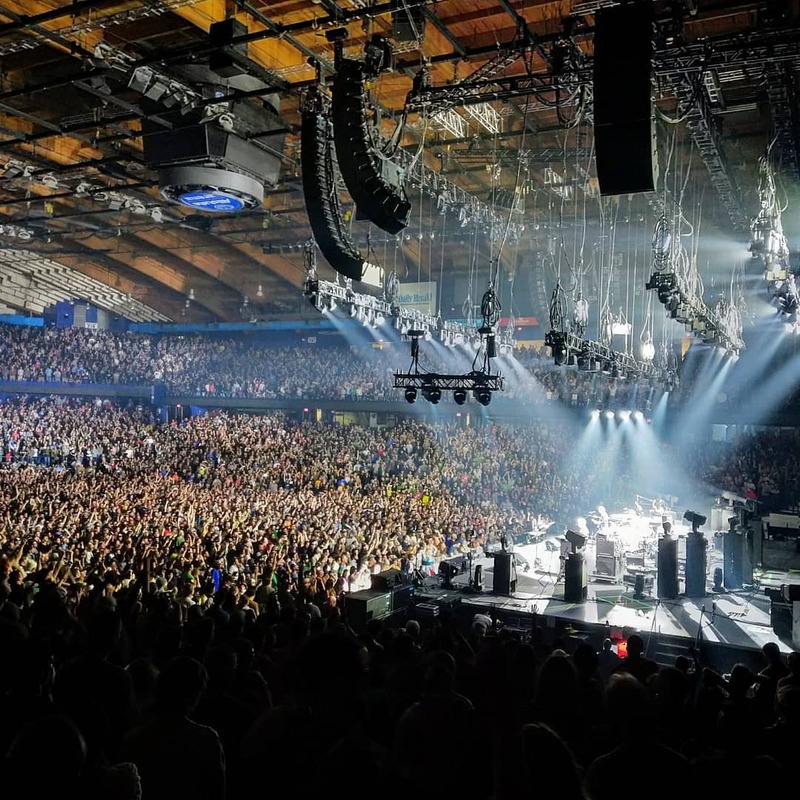 Let me be honest with you: I’ve been seeing a lot of Phish over the last 5 years (including 74% of the shows since Fare Thee Well), but have been avoiding coming out here based on the numerous negative comments I’ve read about the crowds. While there were some elements of truth to what I might have read, I am happy to report that the audience last night was very appreciative, energetic and engaged. In fact, this was a crowd any band would die to play for. Eat your heart out Coastal Elites! One thing I will say is that anyone who’s ever complained that Phish audiences are mostly made up of dudes must be from Chicago. Hot damn, you all need to get some wives, girlfriends, sisters or platonic patchwork wearing female friends (it’s okay if you’re secretly in love with them, just please be respectful and don’t keep bringing it up if she’s not down with the clown) and for God’s sake, bring them to the show! A nice guy named Justin did give me a little piece of jasper though and I just happened to be surrounded by New England fam in my rage zone, so that was cool. There’s nothing quite like a second set “Tweezer” opener to stoke the embers of an already lit crowd and get them burning even brighter. 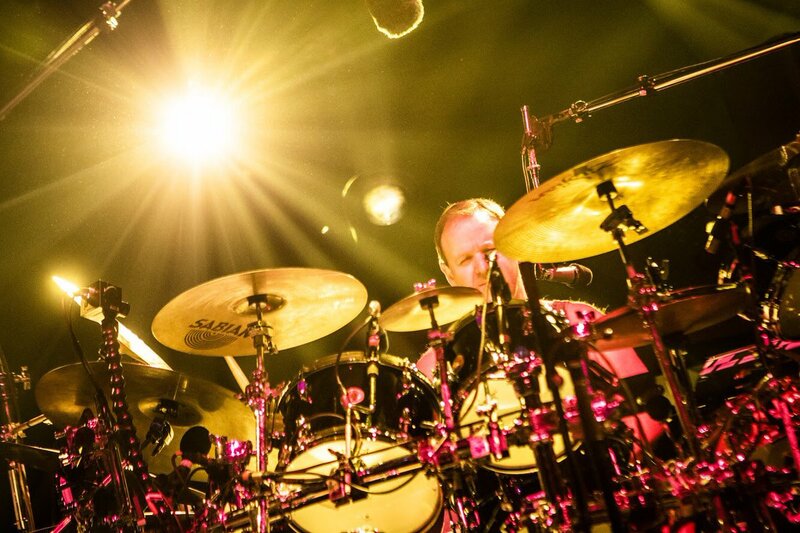 The first “Tweezer” of the tour in Hampton had already set the bar relatively high, but this version surpassed it. Starting with major key jamming, moving into a “Cars Trucks Buses” or “Party Time” flavored New Orleans jam, finding itself in a series of excellent peaks and finally cooling down into a darker rhythmic zone to execute a solid drop into “Golden Age.” This version was noteworthy, not only for the exemplary playing but also for the jam going type II from the first section (“don’t you falter”) and then subtly oozing into the minor jam as opposed to starting the improv from the song’s main riff as per usual. More amazing peaks are scaled and we’re left with as strong a one-two punch as we’ve got all tour. The playing in the opening pair of songs was already magical enough to bring this show into the solidly above average category, but it was definitely time for the band to take a breather, and thankfully they made a very solid call by easing into the rarely played ballad “Frost.” Seeing as this is the official recap, it’s time we officially state that this song is indeed officially a nod to Jerry. I thought calling this song here was super heady (similar to “Show of Life” after the tiger-cage hell-ride of the Albany “Twenty Years Later”). From here on out the rest of the show was icing on the cake. “Sand” and “Possum” were both high energy and “Limb by Limb” contained some supple playing, but on the whole this second set was structurally more similar to the kind of sets they played earlier in 3.0 where the improvisational meat was served earlier on in the set. Cake and meat, how’s that for mixed metaphors? I always get a kick out of the Phish reference in “Day in the Life” (“having read the book”). How did the Beatles know about Gamehendge back in 1967? NOD TO JERR IS OFFICIAL!!! Great review! I generally try and stay away from the term "best" as well. After all, that only really means favorite anyway since it's all so subjective. They brought the heat last night during the jams, no question. Some first set flubs were easily made up for in numerous other ways. Each show really has it's own unique vibe this tour. I'm hanging onto every note and can't wait to see what comes next each night. Go Team Phish!!! Good call on Skin it Back. So we actually still need a Halloween track from the Who, Little Feat, AND the Beatles. I would love a Helter Skelter, Time loves a hero or a Fat man in the Bathtub. Drowned is always a treat and has brought the fire the last few times. Onward and upward to night 2! Last night was a lesson in lights. Wow. Just wow. I enjoyed the Tweezer opening II (always my favorite spot in the set (1997/12/06) It's not a sound a hear much from them, this type of tribal sound. I experienced there debut of mind left body at UIC 94. I was imminently aware of the Bowie jam intro going sideways, very familiar and always playing GD 1974 mlbjams on tape at the time. 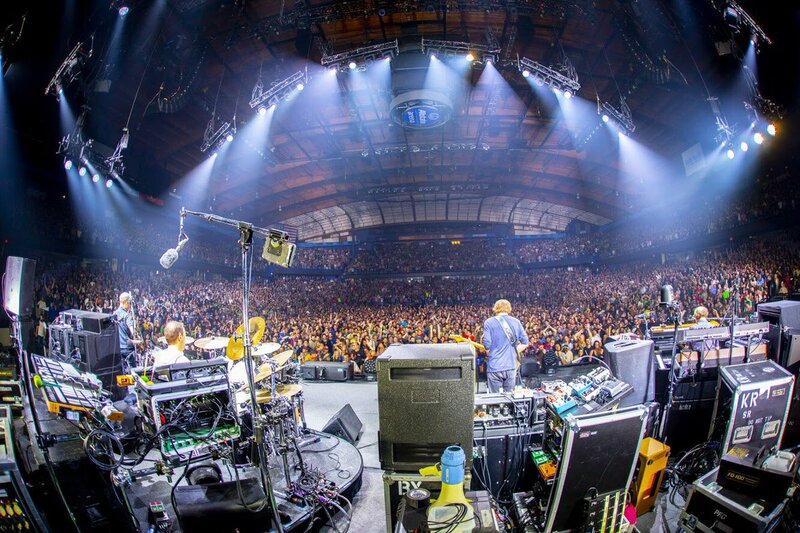 Then oddly enough the last Grateful Dead performance of the MLBJ was 1993/03/10 in Rosemont (very intense Corrina> MLBJ). This is the light tribal percussion I'm speaking of, I remember thinking how odd that they both covered it in Chicago in about a year of another. Wonderful thunderous very much like hearing GDTRFB groove into NFA on that beautiful train, the edge of that sound and energy. This type jamming in this rather nice to hear in Tweezer's free zone outro jam...Building into the intro of Golden Age seems it may be a jam they're playing with. Whatever it is, I love it! Snuck in a few Gems last night TGIF! Spot-on and engaging af. Great read about a great show. It's fantastic to see you writing here @TwiceBitten!